Stargaze on a clear and very dark night and you may see one. It’s a point of light that looks like a star among thousands—until you notice it’s moving. You likely have spotted a satellite orbiting Earth. Satellites truly are the stuff of rocket science. While humans have been launching satellites into orbit since 1957, only in the past 15 years or so has satellite technology been really accessible to the general population. We have come to rely on satellites for many everyday activities, such as navigation, entertainment, and communications. Most of these activities rely on groups of satellites working together, known as constellations. One of the most well-known satellite constellations is the Global Position System (GPS). GPS is only one of several operational or planned global satellite navigation systems. The GPS system is owned and operated by the US Government. Russia has operated its own GLONASS system for nearly as long as the GPS system. Europe is building out the Galileo system. India and China are constructing their own satellite navigation networks. 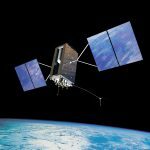 GPS is a constellation of 31 satellites orbiting in a medium Earth orbit of about 12,540 miles above the surface of the Earth. It may be useful to visualize orbital size and scale in comparison to a basketball-sized Earth (about 9.5 inches in diameter). On our basketball-sized Earth, the GPS constellation would be almost 15” from the surface. The GPS satellites are traveling at around a fairly speedy 8,700 mph. In order to provide a three dimensional location of a receiver device (for example, a smartphone), visibility of at least four different GPS satellites by the receiver is required. In the current GPS satellite configuration, at last 6 and usually 8-10 satellites are visible from nearly any point on Earth at any given time, although that number will vary as the satellites move. Besides GPS satellites, delivery of entertainment content via satellite has become hugely popular, with broadcast satellite companies like DIRECTV (now part of AT&T) and DISH Network providing multimedia content through their own satellite networks. DIRECTV, as an example, owns a constellation (or fleet) of 14 satellites operating in our skies. The satellites are in geostationary orbit of 22,236 miles above the surface of the Earth. Using our basketball-scale Earth, that would be almost 27” (or nearly 3 Earth diameters) away from the surface. The satellites are travelling at a modest 6,700 mph. Recall that a satellite orbiting in geostationary orbit appears static to a stationary Earth observer (so the satellites you see moving in the night sky are definitely not DIRECTV satellites). These orbits can only be achieved with the satellites positioned directly above the equator. Due their great distance from the Earth, the potential ground coverage area of any one of these satellites can be very large—e.g., a thousand miles or more. That of course means everyone in the coverage area nominally receives the same broadcast signal. In order to deliver more regional content, DIRECTV also uses what are known as “spot beams,” or directional signals, to deliver the regional content to a more localized geographic area, but even this “local area” can be a range of 100 miles or so. Another familiar type of satellite you might spot in the sky may be part of the satellite phone infrastructure. While satellite phones are not a mainstream consumer item, they provide truly global voice and data communication, even including those remote areas where no one is willing or able to build a cell tower. One of the more well-known telecom satellite constellations used for voice and data communications is the Iridium system, originally developed by Motorola. Iridium is constellation of 66 satellites in a low Earth orbit of only about 485 miles above the surface of the Earth. On our scaled basketball-sized Earth, that would be a mere half-inch from the surface. The satphone satellites are whizzing around at nearly 17,000 mph and arranged in a series of polar orbits, which enables each satellite to pass over both the north and south poles in its orbit. It is, of course, a necessity that the Iridium system be bidirectional in communication, having both uplink and downlink between the handsets and the satelites. The two above-mentioned systems provide only a downlink to the end user receiver (e.g., the GPS handset or dish). There is no communication back to the satellite for these systems. In addition, as the satphone satellites are so low and moving so fast, a complicated interlinking system between adjacent satellites is required since any given satellite is only visible to a handset receiver for a few minutes. A satellite handset will see one or maybe two satellites at any given time, so hand-off between satellites is critical in order to maintain a connection with a ground-level receiver. These are just a few examples of satellites that we may interact with regularly. Whether it is our GPS receivers, or satellite TV systems, or communications via satellite phones, it is amazing to view the skies and think how much consumer electronics relies on technology orbiting the Earth thousands of miles away. There are many more satellites that we depend on up there—weather imaging satellites, super-secret reconnaissance satellites, telescopes, space stations, etc. It really is getting crowded up there. Have an IP project in this technology space? Contact us today to get started.